Over dinner we’ll talk about where we’ll be headed, then catch sunset on Mono lake followed by two planned (and possibly more unplanned locations). 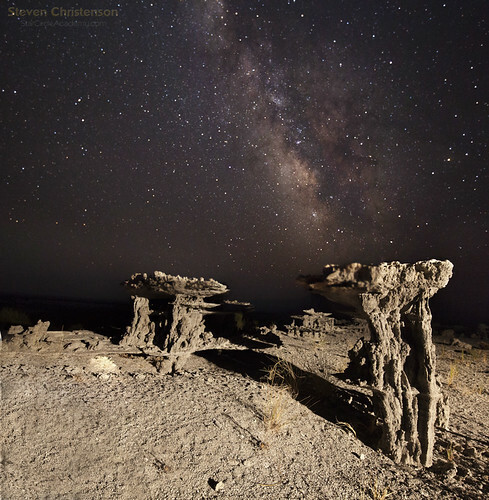 We know, for example, where we can find some less well-known formations around Mono Lake. We recommend that you have a high clearance vehicle. 4WD or AWD is recommended, however the area is passable with most passenger vehicles – this is just not the place or event to bring your low-slung Lamborghini, but if you do, don’t give Eric the keys 🙂 We can arrange carpools at Whoa Nellie if needed. One location will require about a one mile round trip hike from the parking area over mostly level ground. The other location is a much shorter hike. Your hosts will bring lighting equipment to do some light painting. Weather permitting we’ll have views to the north, and the Milky Way to the south. Please be sure to check the weather for Lee Vining and be prepared with appropriate dress. During the summer It can be very chilly with wind at night even when it is as much as 100 degrees during the day. Would you like to be the first to know when this event is scheduled? Yes, the please subscribe.